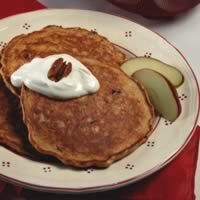 Try these for a sweet and healthy twist on traditional pancakes. Beat eggs, milk, and oil in large bowl until blended. Stir in cereal; let stand until moistened, about 2 minutes. Mix flour, baking powder, cinnamon, and salt in small bowl. Add to egg mixture; stir just until dry ingredients are moistened. Fold in apples and pecans. Heat lightly greased large non-stick skillet or griddle over medium heat until hot. Reduce heat to medium-low. Pour 1/4 cup portions of batter into skillet; cook until golden brown, turning once.